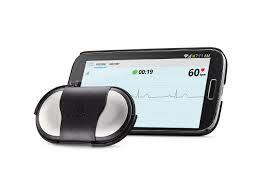 Validation of handheld electrocardiogram devices to detect atrial fibrillation. Study goal – To determine the usability, accuracy, and cost-effectiveness of two handheld single-lead electrocardiogram (ECG) devices for atrial fibrillation (AF) screening in a hospital population with an increased risk for AF. Study design – Hospitalized patients (n = 445) at cardiological or geriatric wards were screened for AF by two handheld ECG devices (MyDiagnostick and AliveCor). The performance of the automated algorithm of each device was evaluated against a full 12-lead or 6-lead ECG recording. All ECGs and monitor tracings were also independently reviewed in a blinded fashion by two electrophysiologists. Time investments by nurses and physicians were tracked and used to estimate cost-effectiveness of different screening strategies. Study results – Handheld recordings were not possible in 7 and 21.4% of cardiology and geriatric patients, respectively, because they were not able to hold the devices properly. Even after the exclusion of patients with an implanted device, sensitivity and specificity of the automated algorithms were suboptimal. A scenario based on automated AliveCor evaluation in patients without AF history and without an implanted device proved to be the most cost-effective method. Manual interpretation increases sensitivity, but decreases specificity, doubling the cost per detected patient, but remains cheaper than sole 12-lead ECG screening. Therefor, using AliveCor or MyDiagnostick handheld recorders requires a structured screening strategy to be effective and cost-effective in a hospital setting. It must exclude patients with implanted devices and known AF, and requires targeted additional 12-lead ECGs to optimize specificity. Under these circumstances, the expenses per diagnosed new AF patient and preventable stroke are reasonable. Keywords – Atrial fibrillation, in-hospital screening, cost-effectiveness, handheld ECG devices, AliveCor, MyDiagnostick.